When life is getting you down, enjoy the Cabaret Club and you’ll be begging for an encore! With a lovely welcoming bonus and all our favourite slot games on show once you are past the curtain, this casino is worth visiting, if only for the show! Come join this club. 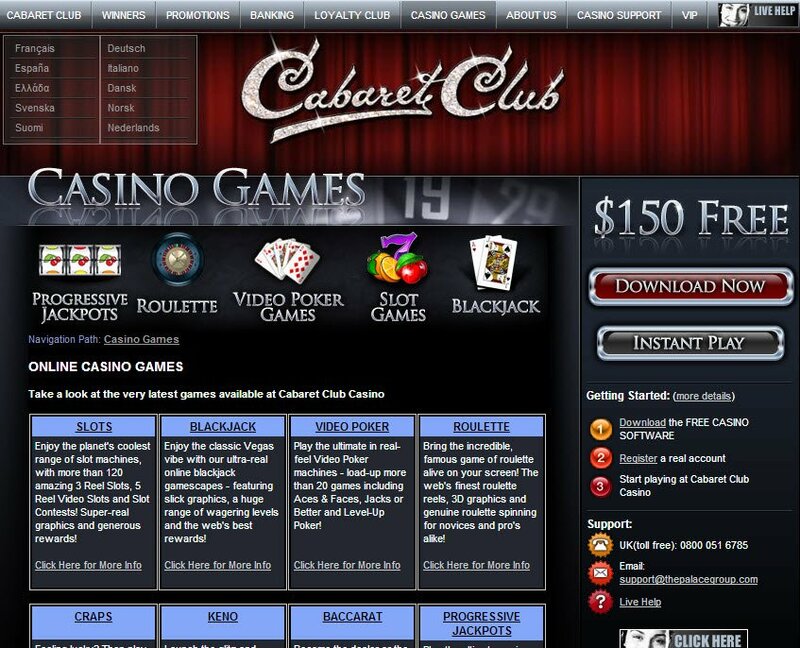 As part of the well-established Palace Group of casinos, and running on the award winning Microgaming software, Cabaret Club opened its curtains back in 2009. They state they are dedicated to delivering 100% fair gaming, in addition to a deluxe online gaming environment. They offer over 330 Vegas styled games and have fully verified independent payouts. They are authorised and licensed by the Lotteries and Gaming Authority of Malta. Downloading Cabaret Club was a breeze and, I couldn't wait to get inside and see what the line up in the lobby looked like. The red curtains opened and, before I knew it I was being welcomed to the Cabaret Club casino by a mysteriously masculine voice. I felt like I had walked into one of the great, warm and wonderful doors of a real live Vegas casino. Thee deep burgundy and shiny silver theme of this classy casino makes it one that stands out as easy on the eye. 10 European languages ensure that its doors are open and welcoming across the whole of Europe. 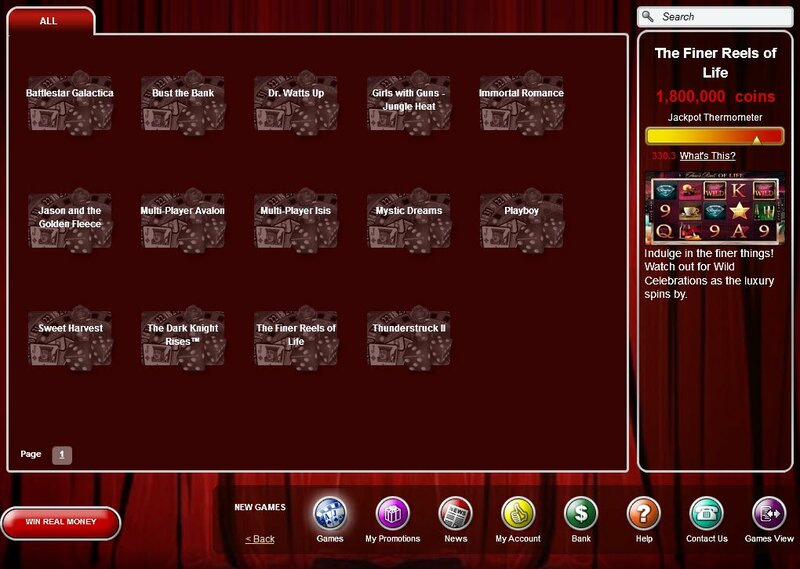 All the most popular, newest games populate this Cabaret Club Microgaming Casino. The lobby is intuitive and easy to use, with new tabs opening up when you click on a different category so you won't lose your place. The current Cabaret Club Casino progressive jackpot is at an astonishing £2,381,870.97 - that’s almost 2 and a half million pounds. As they say, you gotta be in it to win it! In a resplendent move, Cabaret Club makes you feel a part of things by doubling your first deposit with a 100% match bonus up to £150. You'll be cheering for an encore as soon as the curtains close with bonuses like that. 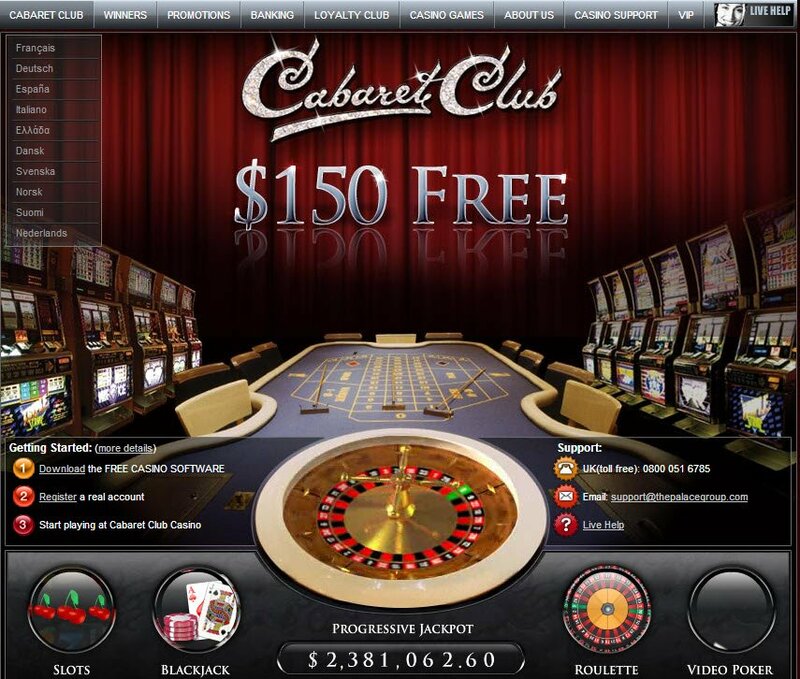 There is no mention of other promotions on their website however and, the "My Promotions" tab on my downloaded casino had an error so I was unable to find any other bonuses or promotions in the Cabaret Club to report to you on. I felt like I had walked into one of the great, warm and wonderful doors of a real live Vegas casino. Unfortunately, due to a further technical error with my account, Waldemar, the Cabaret Club customer support agent was unable to check what promotions were available to me. He did let me know that any promotions I may be eligible for would not kick in until the second week, after my welcome bonus promotion expired. There are a nice variety of payment methods available at Cabaret Club, including Neteller, Paypal, Ukash, EcoCard and Paysafe. All the usual suspects are in the deposit line up and, nine of those are available to withdraw your winnings to. Customer support is offered in a multitude of languages and, there are toll free numbers for the UK, Canada, Australia and, one for the rest of the world. If you wish to email there is an address but, no mention of the turnaround time. I addressed my queries via live chat and, was answered promptly and courteously. Apart from some technical issues that meant my account wasn't actually fully established yet, I was happy with Waldemar's service on behalf of Cabaret Club Casino. Not too many people seem to know about this one, but honestly, it has a great “Las Vegas” look and feel. Worth checking out.